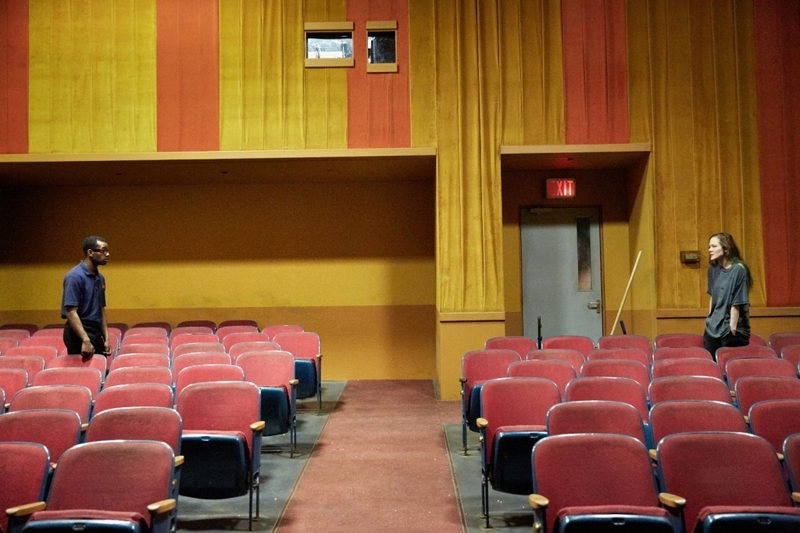 Annie Baker’s The Flick is extraordinary, not least for its indulgence. A study in Time and Motion, imagine a `New Wave’ flick, one of the Antonioni, Alain Resnais films of the 1960s, the lingering long shots, the silence, the non-action, the residual imperative to take time just looking like the proverbial cows in the field. Few would dare to take such risks these days – particularly in this age of hyper-ventilating action. Annie Baker is a multi-award Obie and Pulitzer prize-winner. Her Circle Mirror Transformation, presented by the Royal Court three years ago in a community hall in north London delicately satirised the emotional dynamics of a New England amateur drama group but with infinite empathy. It was a master-class too in naturalism. The Flick, this time with two of its three leading actors cast from the other side of the pond and American director, Sam Gold, also carries the unmistakeable stamp of classy `method’-influenced acting with a love for its `down-at-heel’ protagonists. Baker has in her sights however not just compassion for those left behind by the American dream represented here by two cinema cleaners and the female projectionist, but the very system itself of cinema projection. Indeed, Gold even pays homage to the older style of film-making by way of snatches of Georges Delerue’s gorgeous theme music from Jules et Jim, the archetypal `new wave’ film. A dying art form being overtaken by digitalisation, the whole action, such as it is, takes place in one room, the auditorium of a local Massachusetts cinema where Matthew Maher’s Sam – reminiscent of a younger Ernest Borgnine – and his assistant Avery (a wonderfully nuanced portrayal by Jaygann Ayeh) monotonously clear away customers’ rubbish and vie for the attentions of Louisa Krause’s strung out projectionist, Rose. Damaged goods all, the nature of their troubled relationships slowly reveals itself even as the clearing up of the popcorn and paper cups epitomises the careless individualism of our throw-away society. But like Terrence McNally’s 1987 Frankie and Johnnie in the Claire de Lune (1987), this is an appealing portrait of intimacy longed for but thwarted with terrific performances especially from the mesmerising Maher. Rich rewards to the patient! 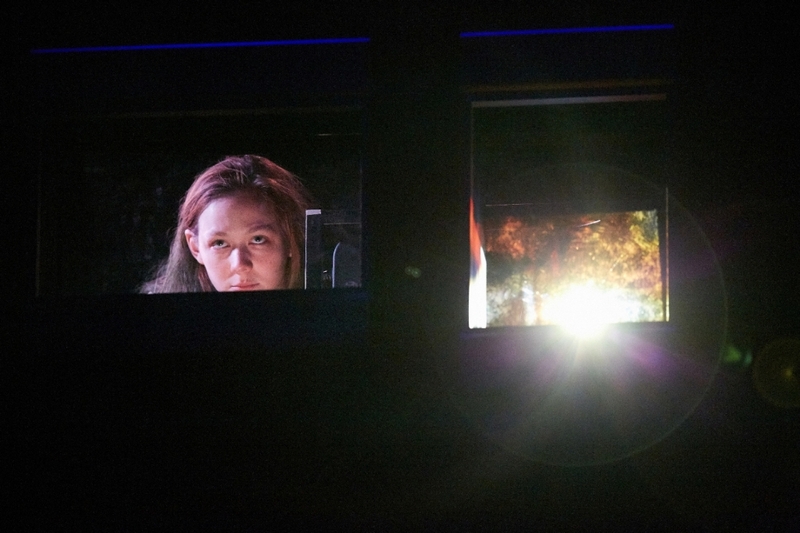 This entry was posted in 2016, Reviews and tagged American cleaners, Annie Baker, digitalisation of cinema projection, Dorfman, Jaygann Ayeh, Louisa Krause, Matthew Maher, National Theatre, Sam Gold on May 15, 2016 by Carole Woddis.